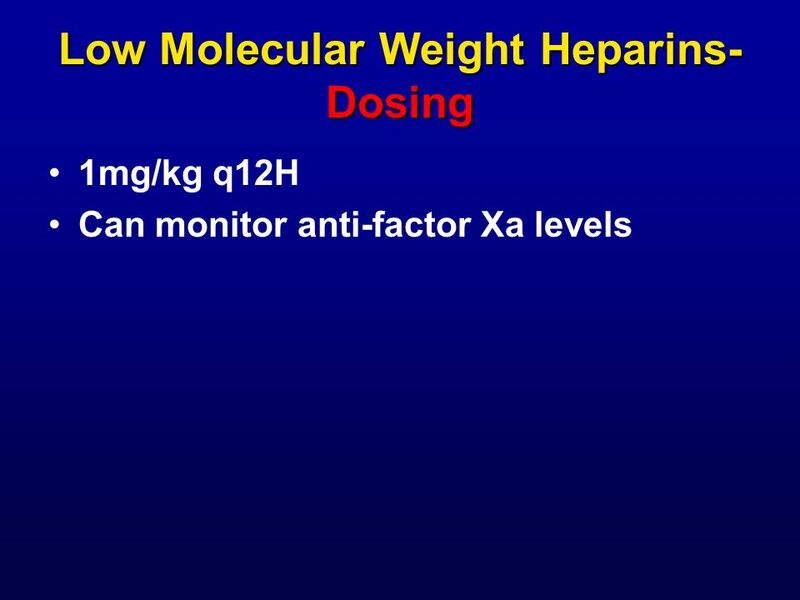 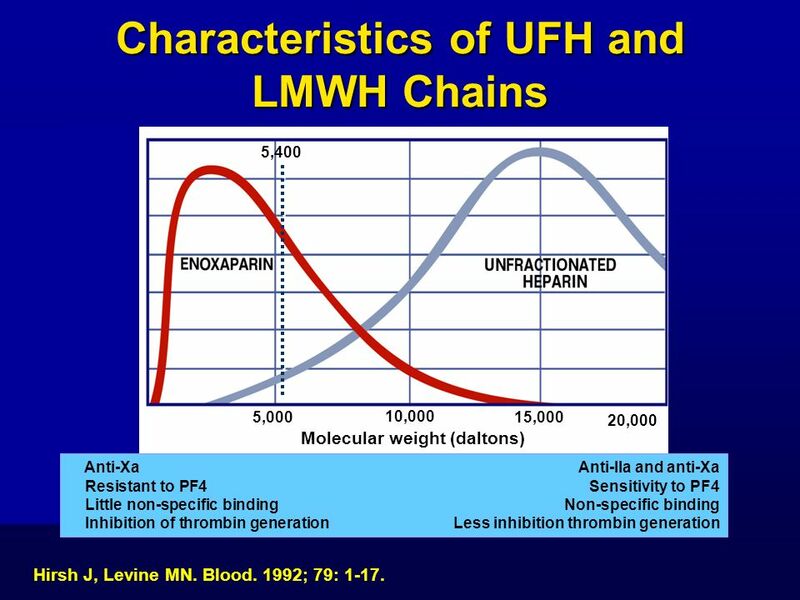 5,400 5,000 10,000 15,000 20,000 Molecular weight (daltons) Anti-Xa	Anti-IIa and anti-Xa Resistant to PF4	Sensitivity to PF4 Little non-specific binding	Non-specific binding Inhibition of thrombin generation	Less inhibition thrombin generation Hirsh J, Levine MN. 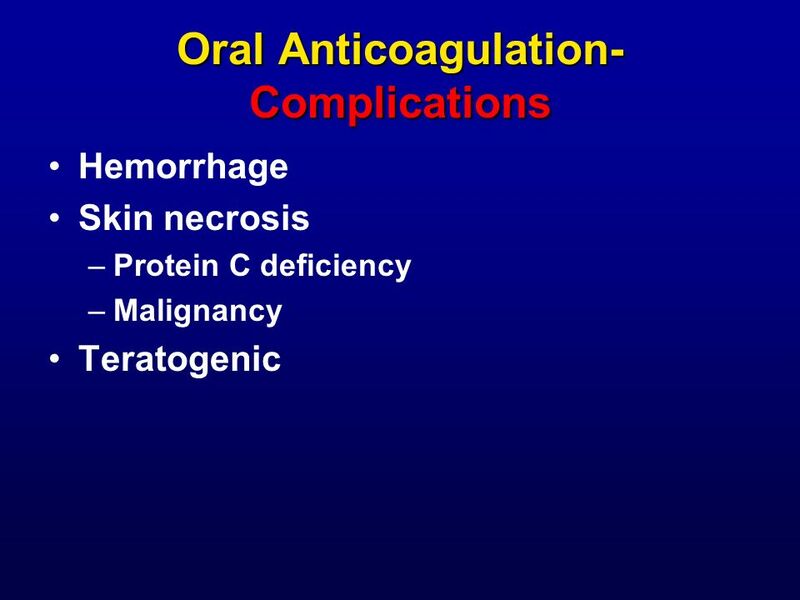 Blood. 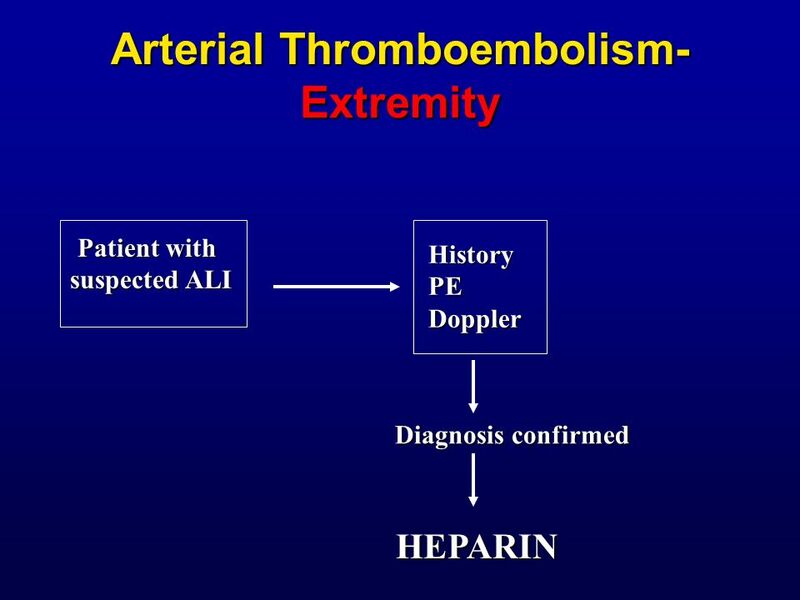 1992; 79: 1-17. 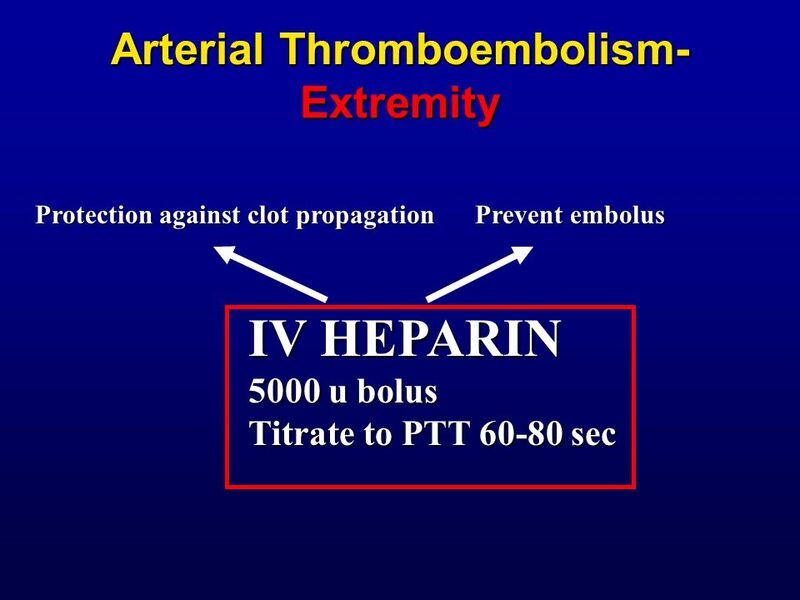 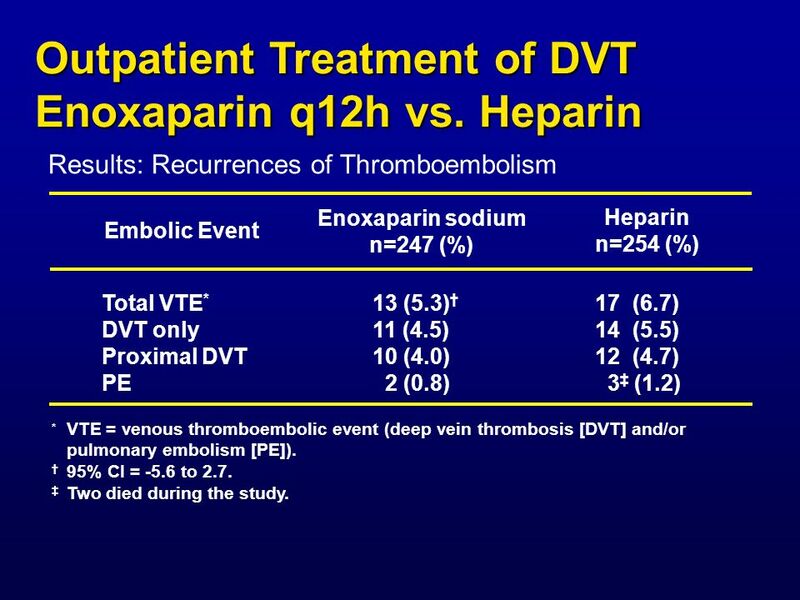 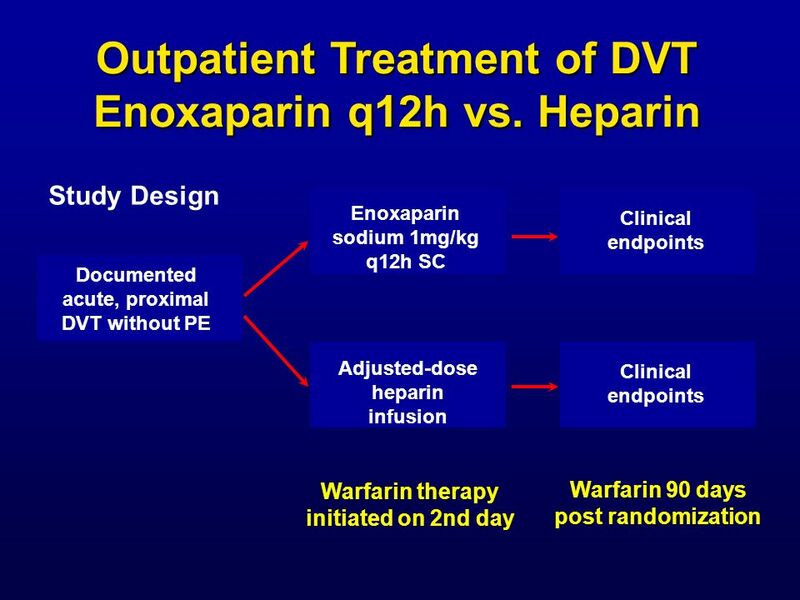 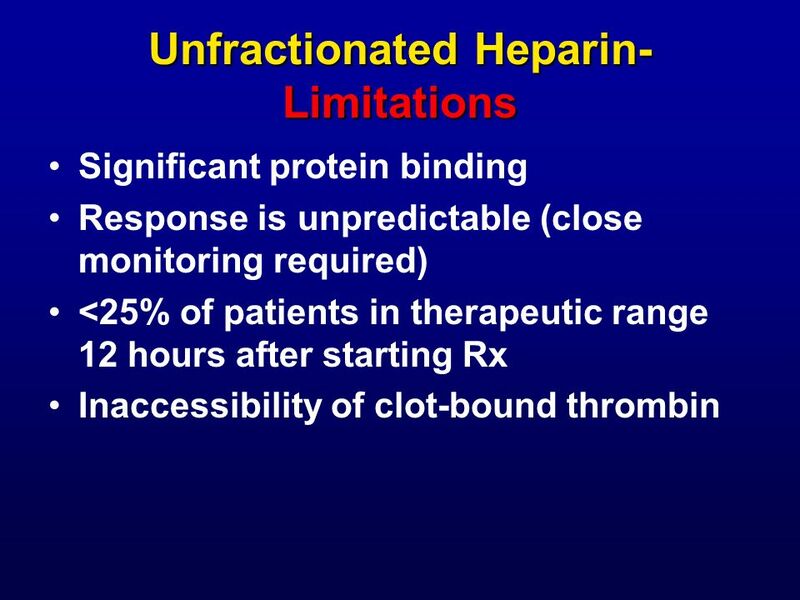 Results: Recurrences of Thromboembolism Enoxaparin sodium n=247 (%) Heparin n=254 (%) Embolic Event Total VTE* DVT only Proximal DVT PE 13 (5.3)† 11 (4.5) 10 (4.0) 2 (0.8) 17 (6.7) 14 (5.5) 12 (4.7) 3‡ (1.2) *	VTE = venous thromboembolic event (deep vein thrombosis [DVT] and/or pulmonary embolism [PE]). 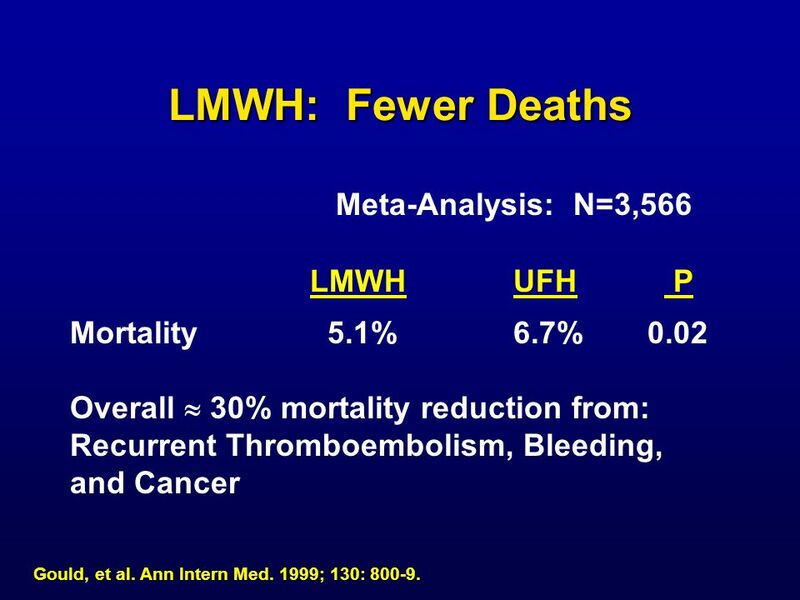 †	95% CI = -5.6 to 2.7. 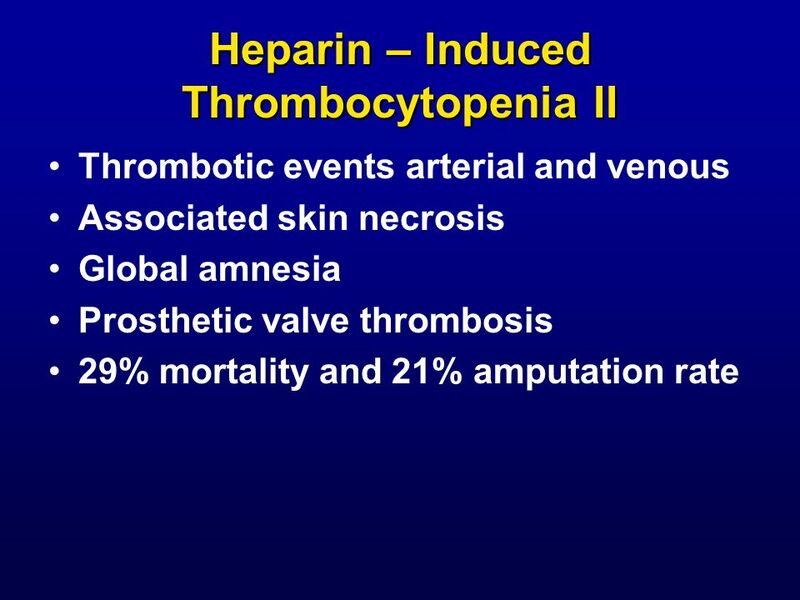 ‡	Two died during the study. 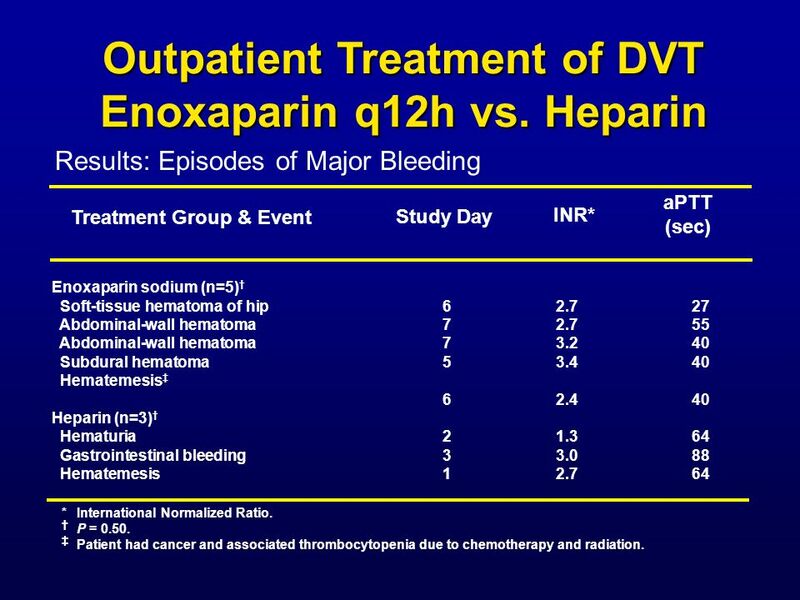 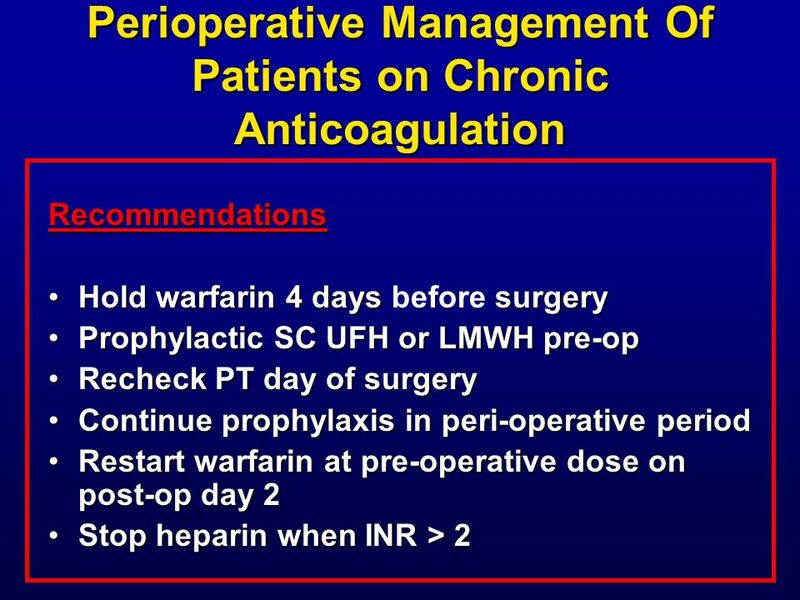 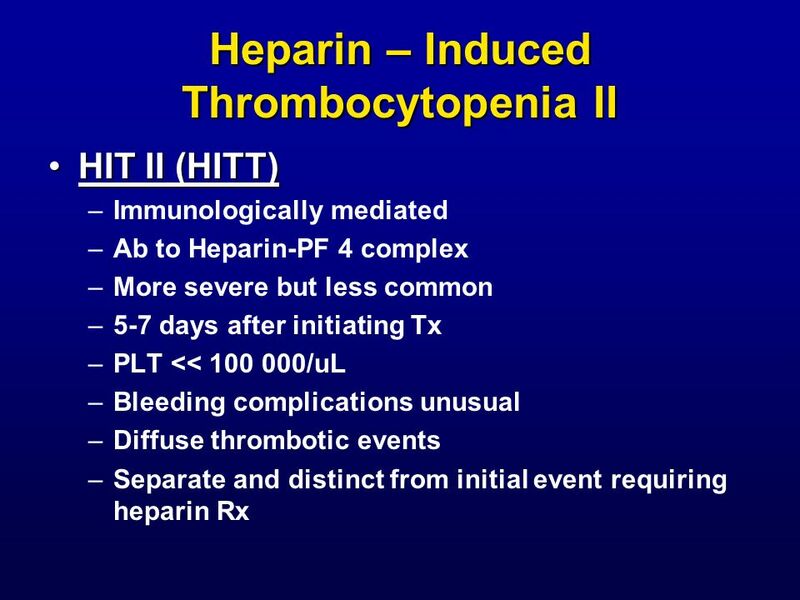 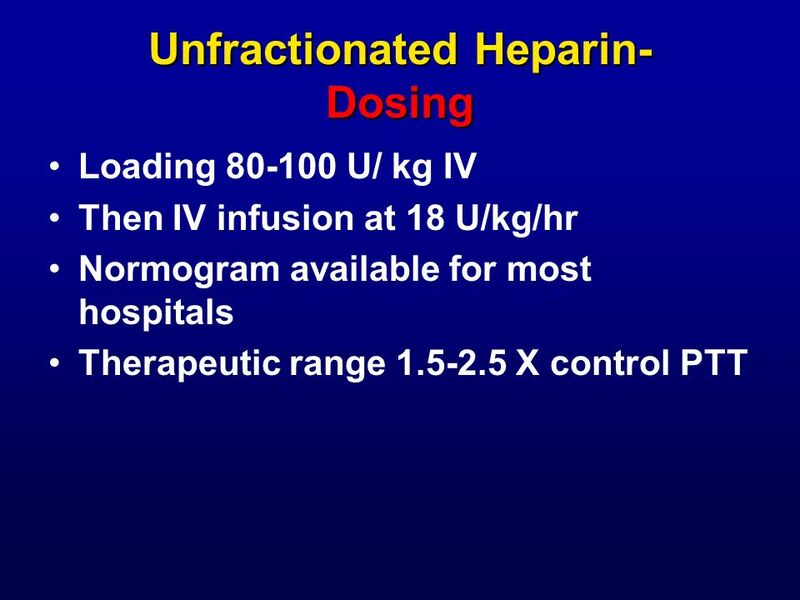 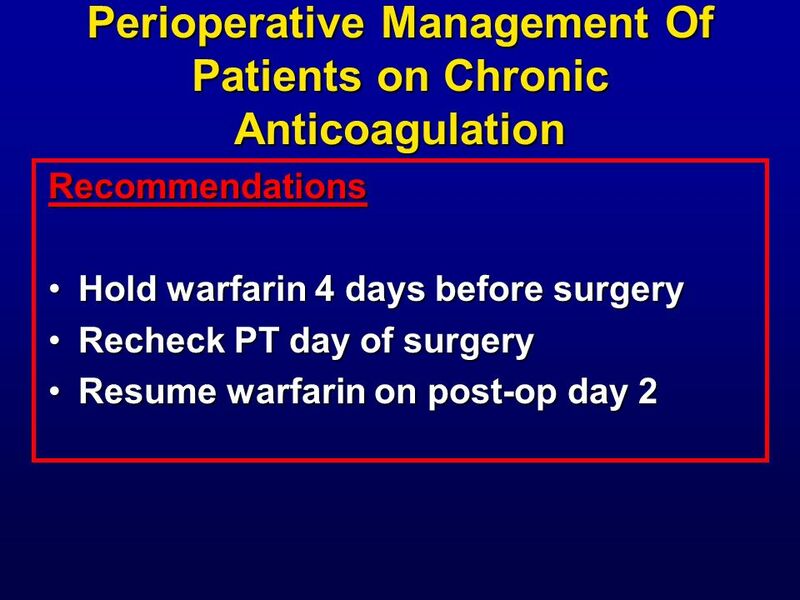 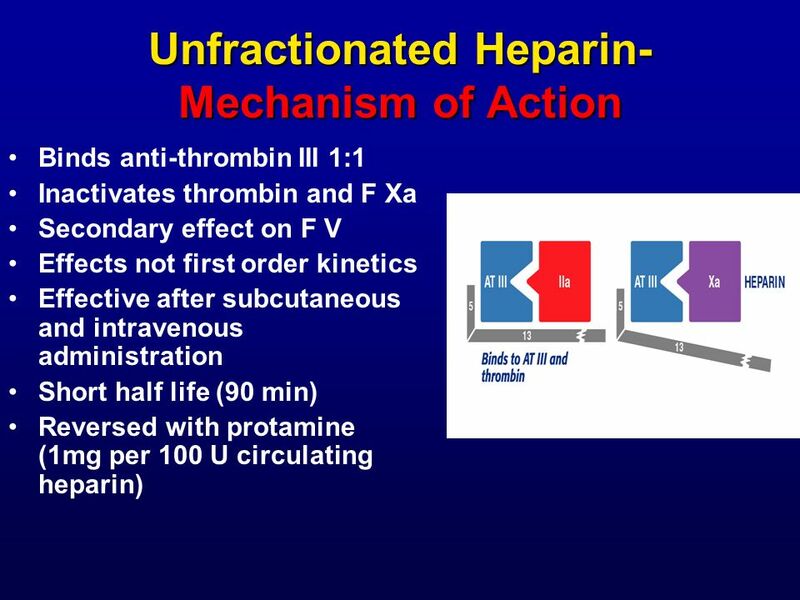 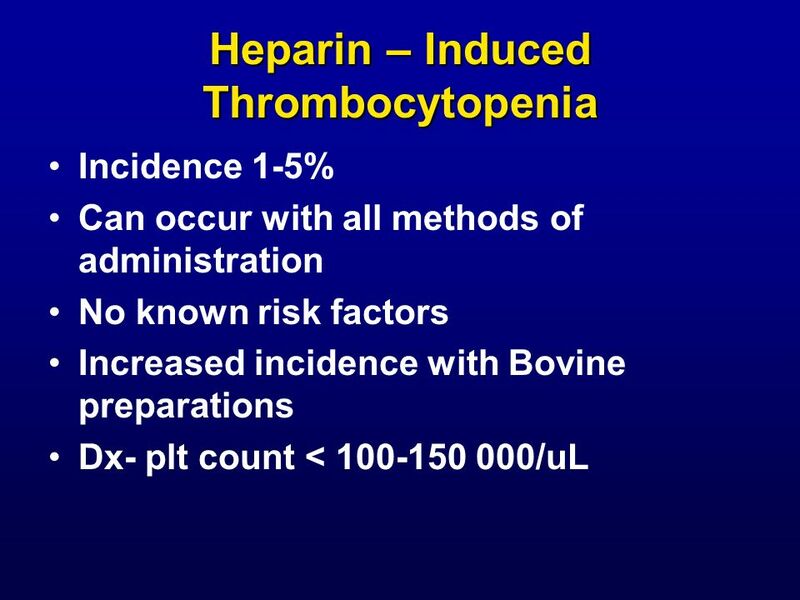 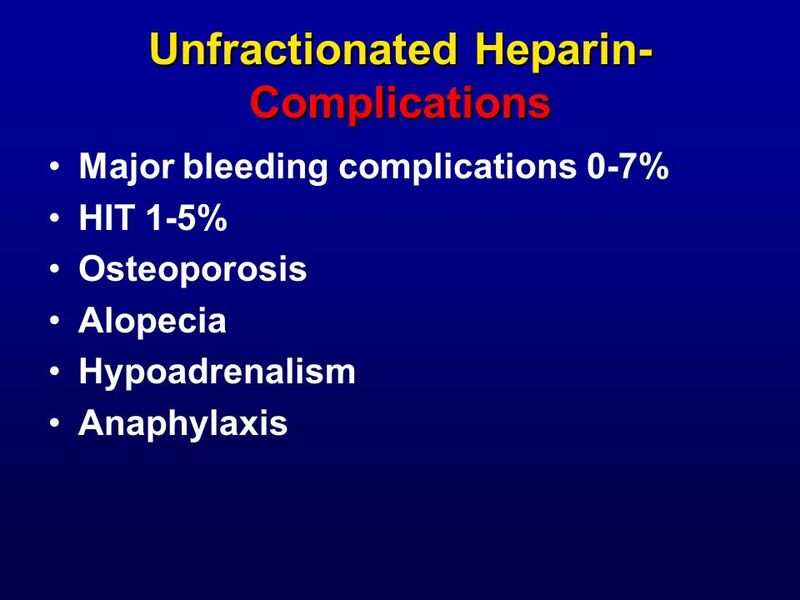 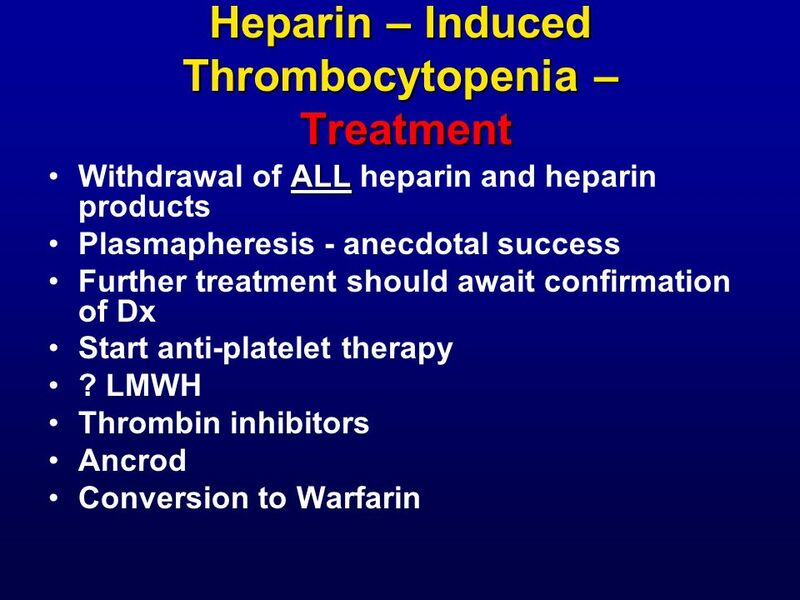 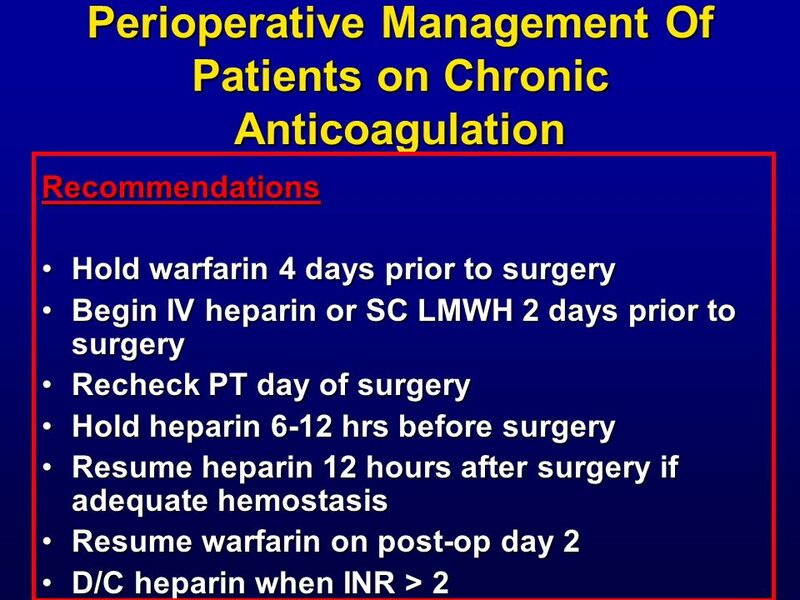 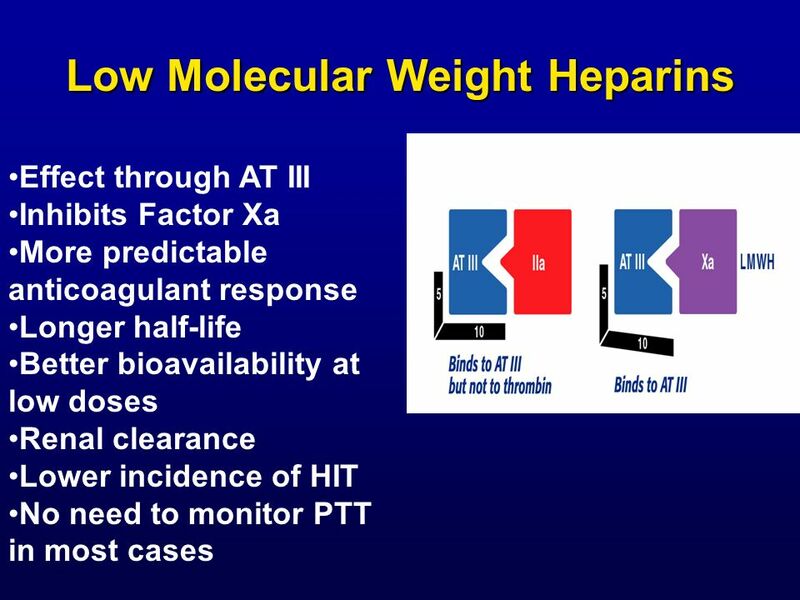 Results: Episodes of Major Bleeding aPTT (sec) Treatment Group & Event Study Day INR* Enoxaparin sodium (n=5)† Soft-tissue hematoma of hip Abdominal-wall hematoma Abdominal-wall hematoma Subdural hematoma Hematemesis‡ Heparin (n=3)† Hematuria Gastrointestinal bleeding Hematemesis *	International Normalized Ratio. 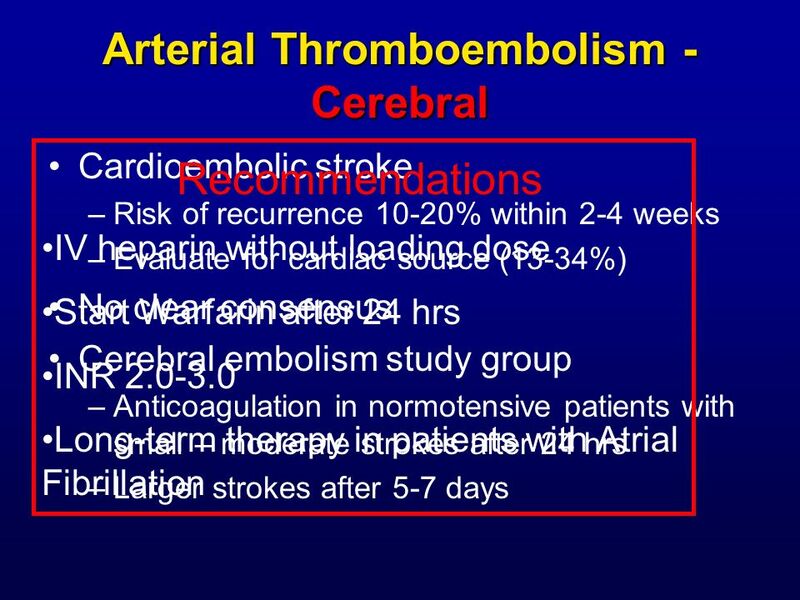 †	P = 0.50. 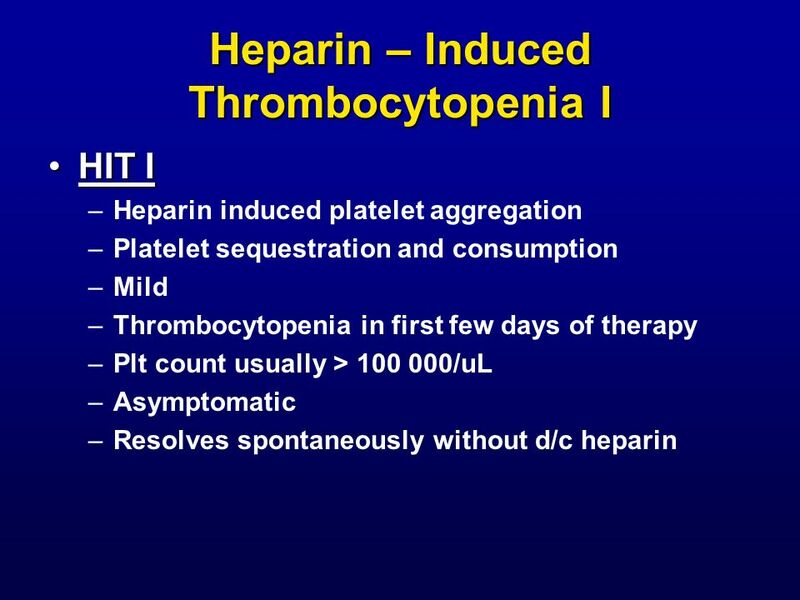 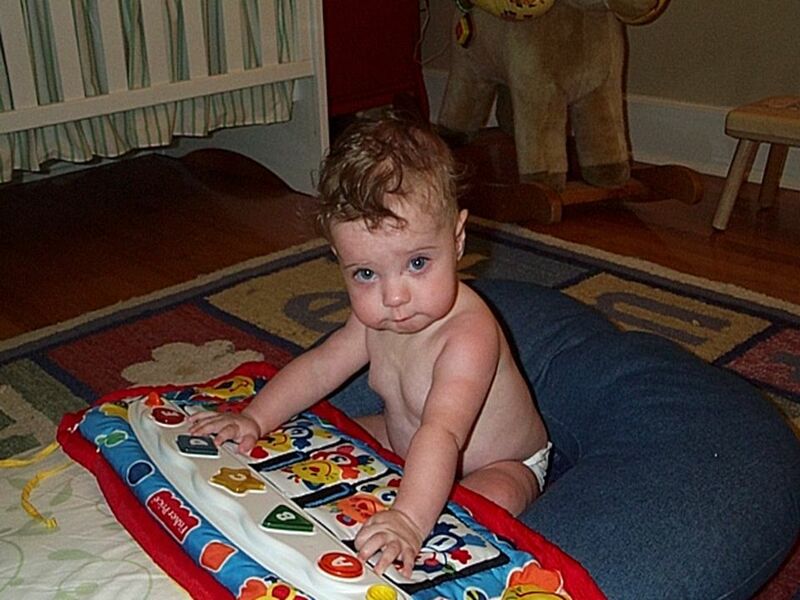 ‡ Patient had cancer and associated thrombocytopenia due to chemotherapy and radiation. 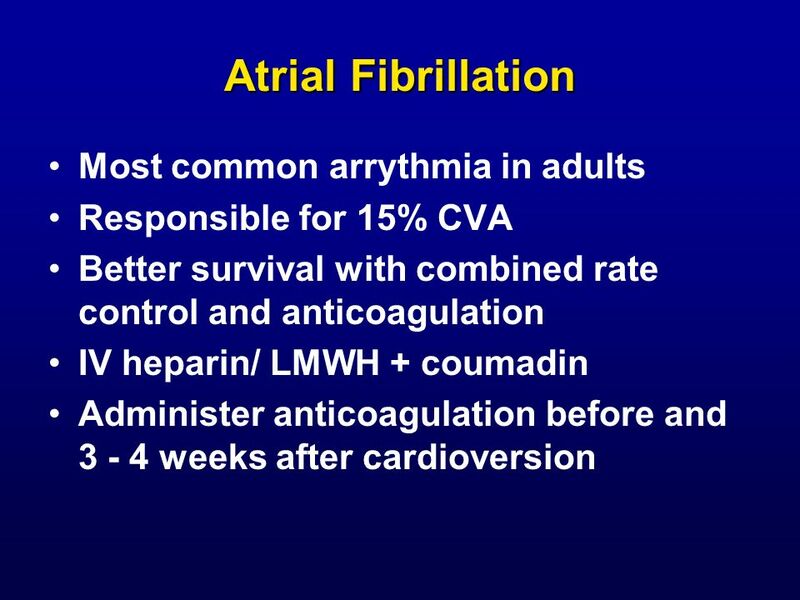 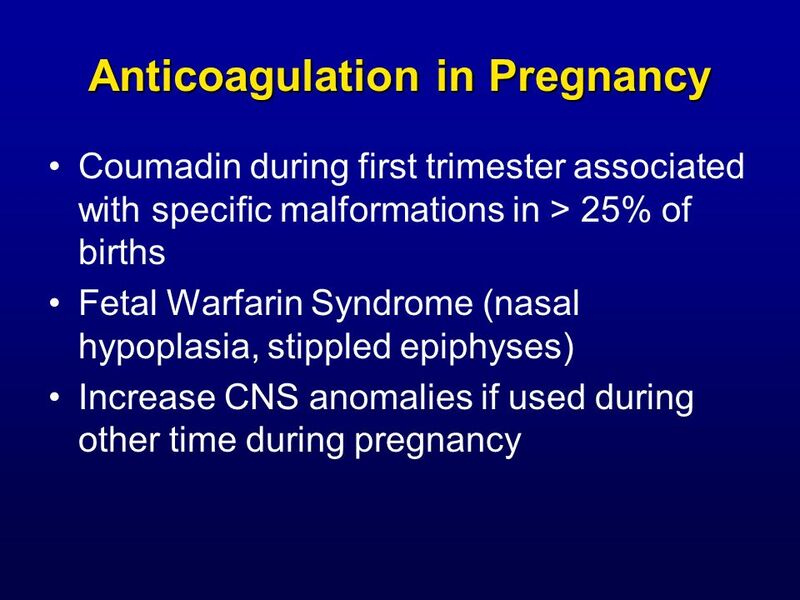 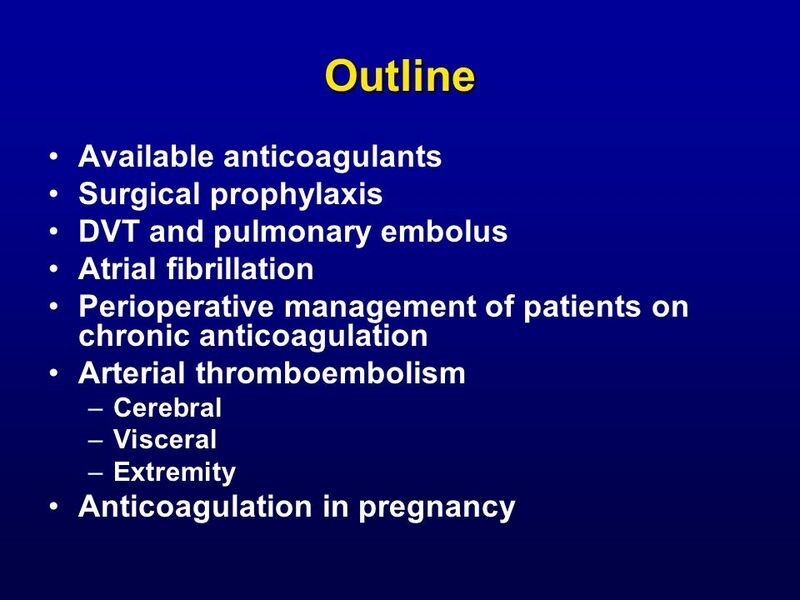 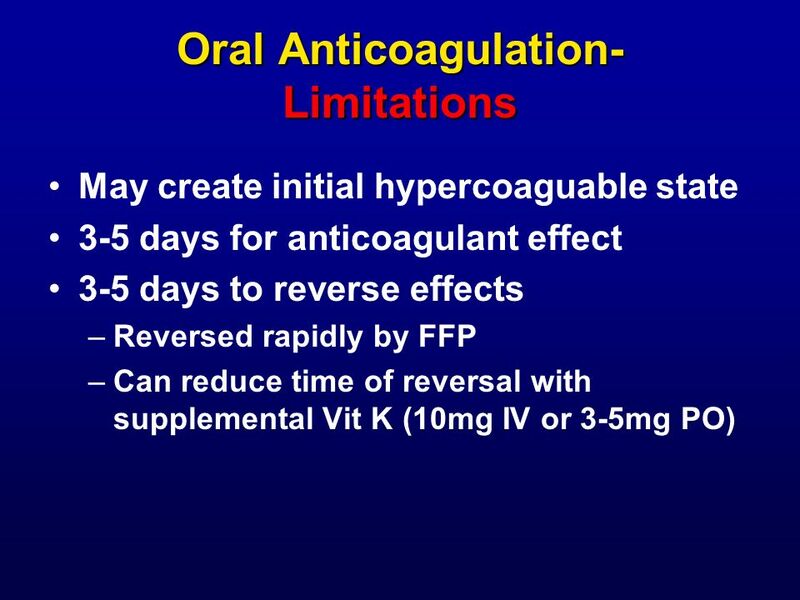 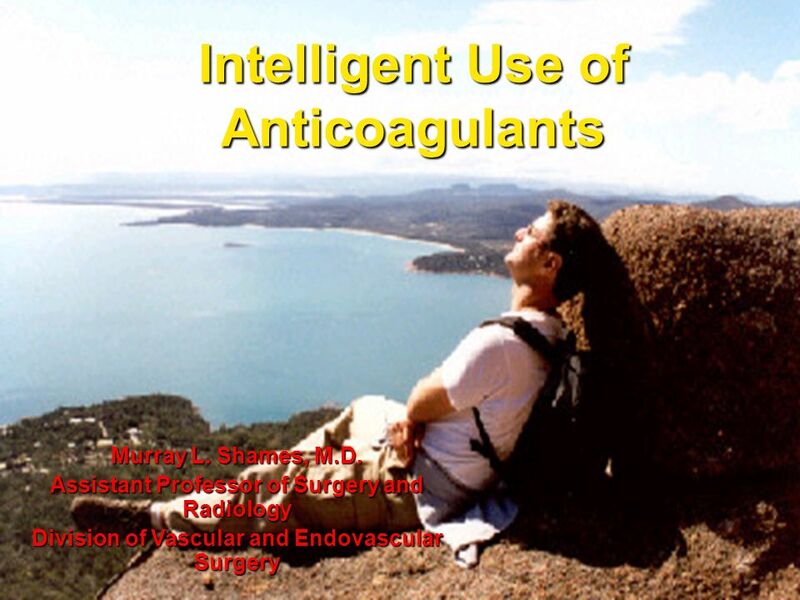 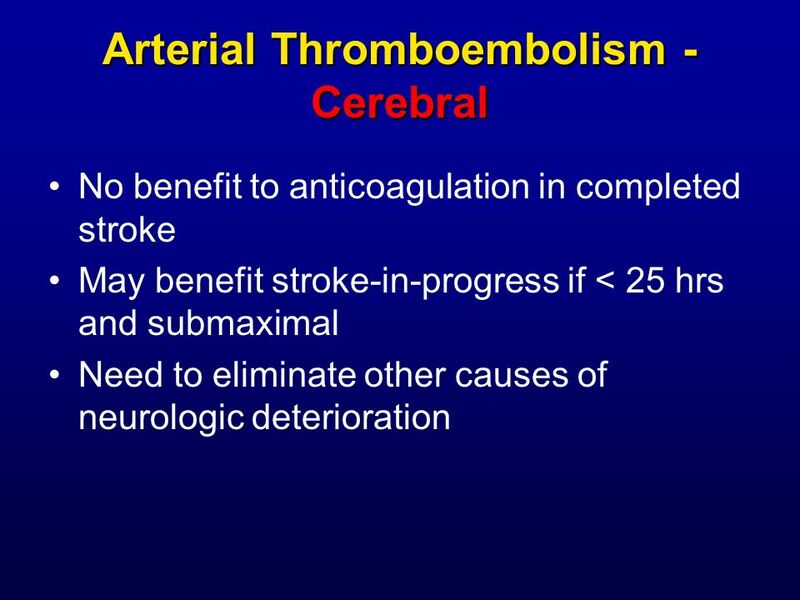 Download ppt "Intelligent Use of Anticoagulants"
GUSTO-IV AMI G lobal U se of S trategies T o Open O ccluded Coronary Arteries in AMI. 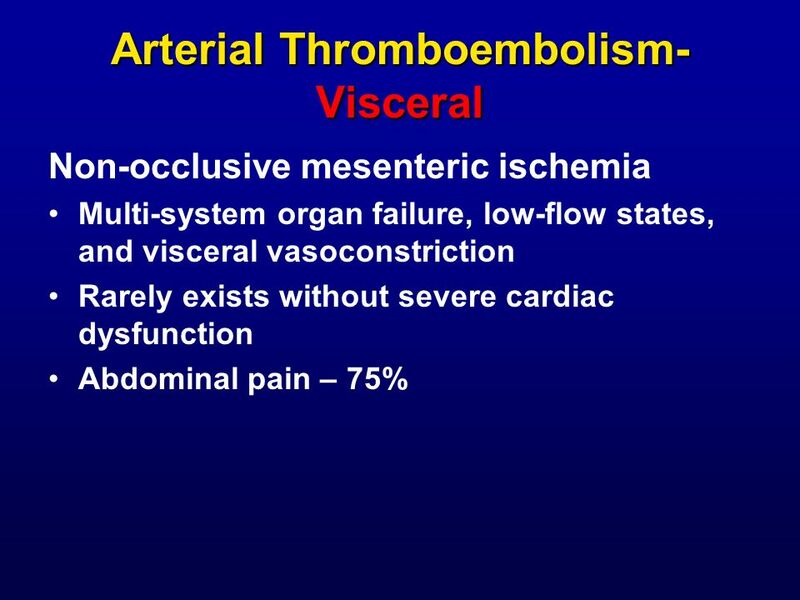 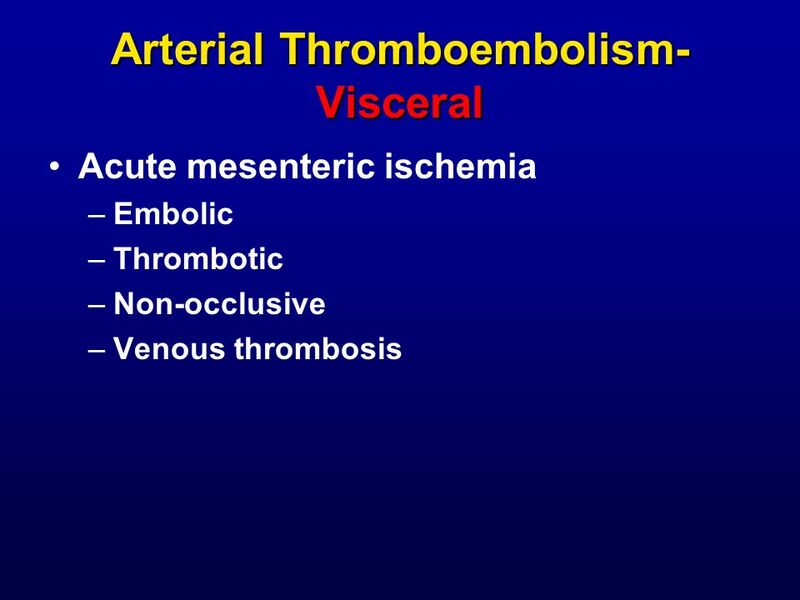 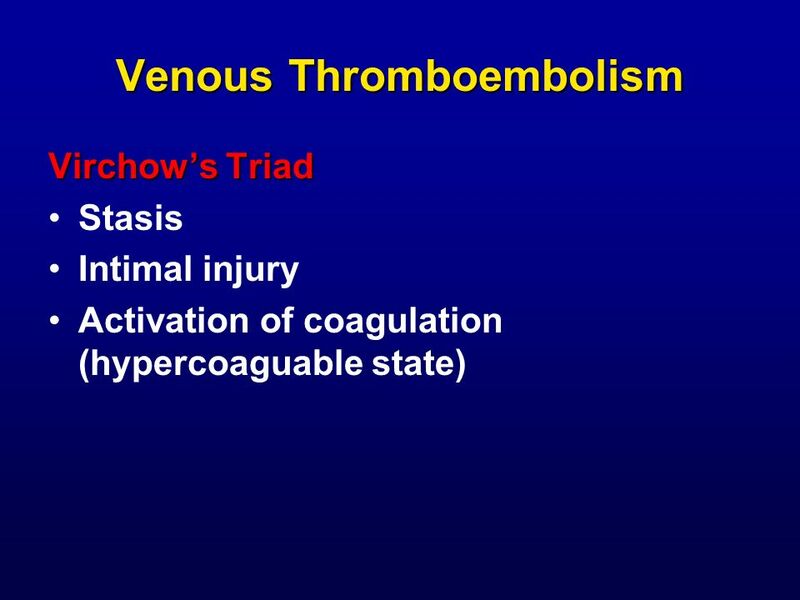 Acute venous or arterial thrombosis Acute venous or arterial thrombosis Is there an indication for thrombolysis? 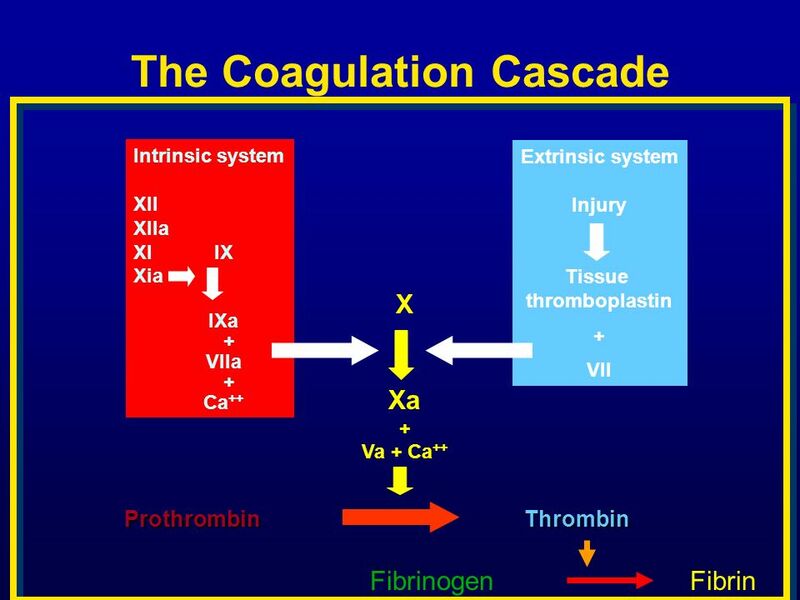 Baseline labs: CBC, PT, PTT, fibrinogen. 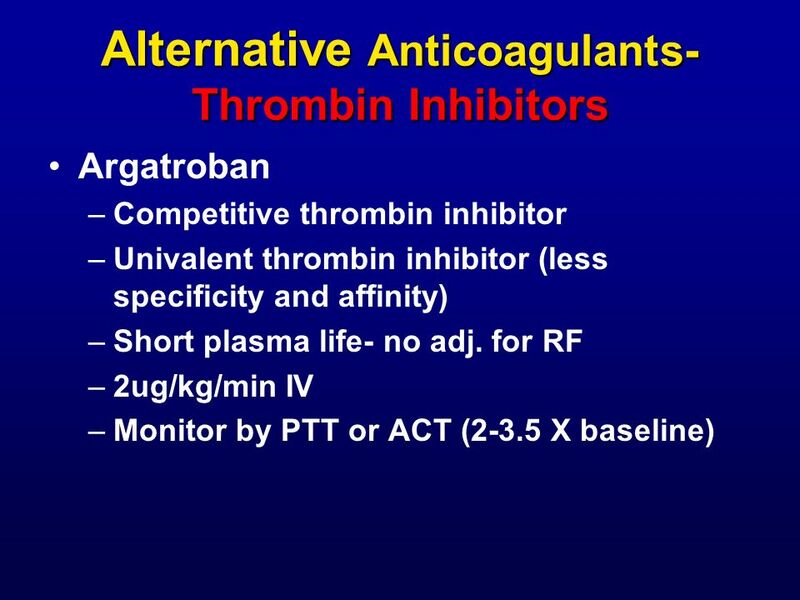 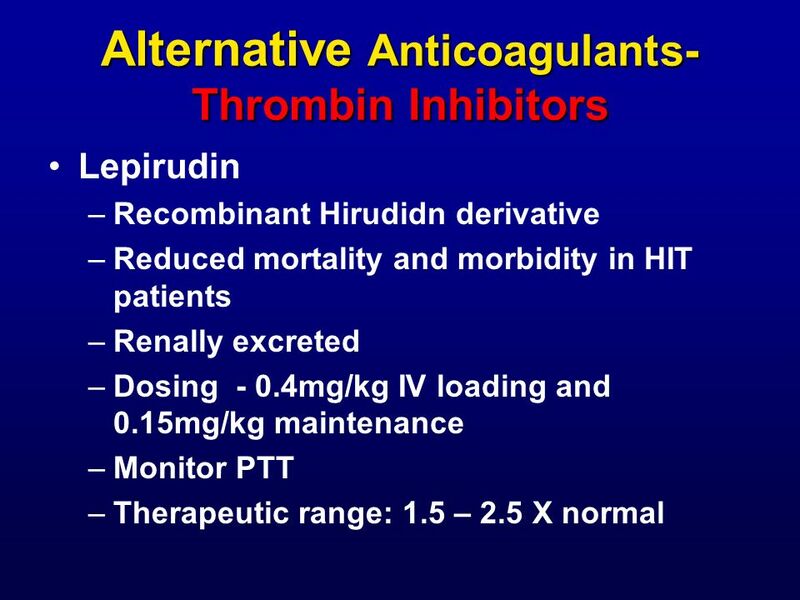 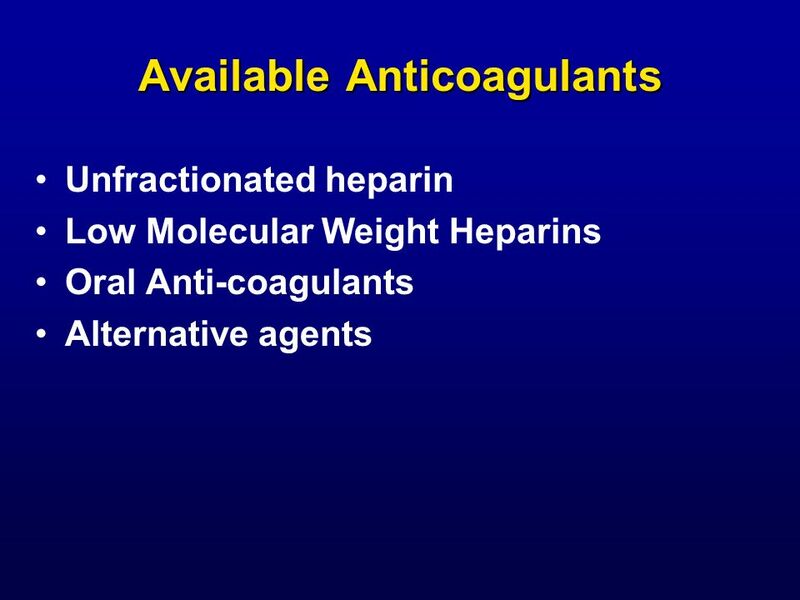 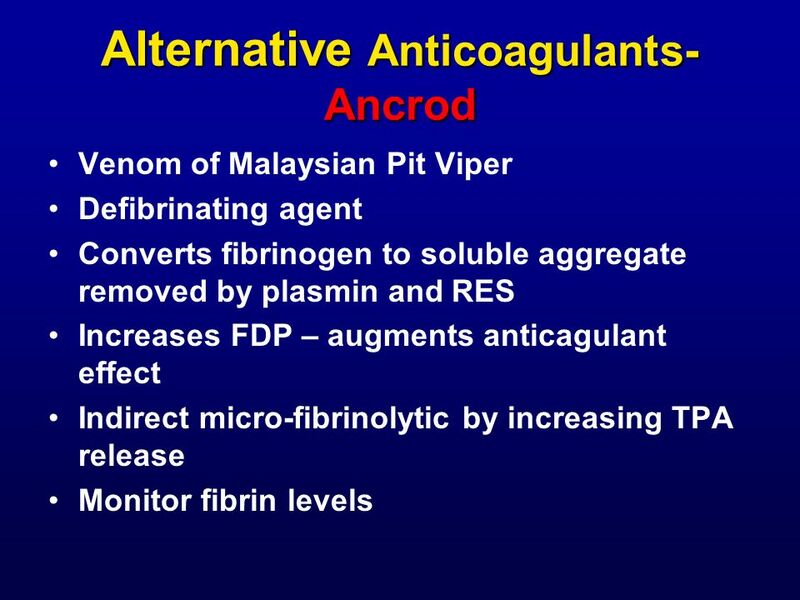 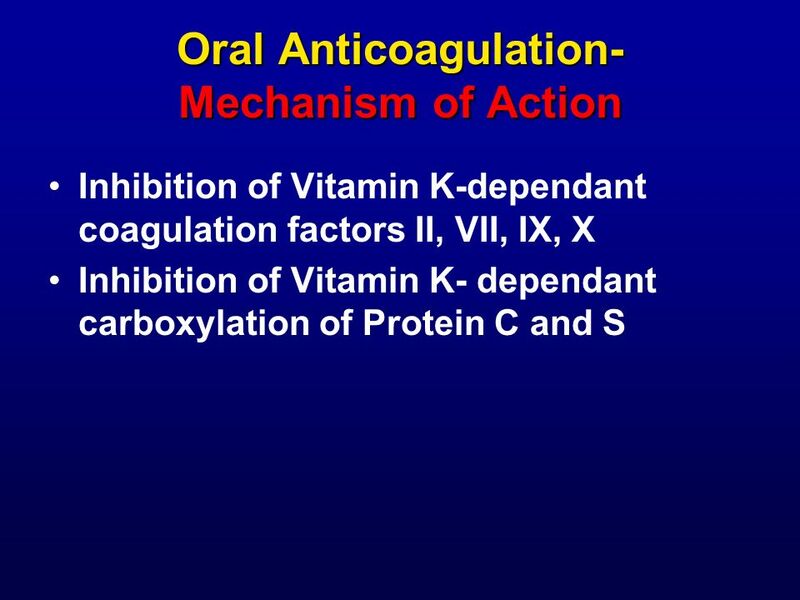 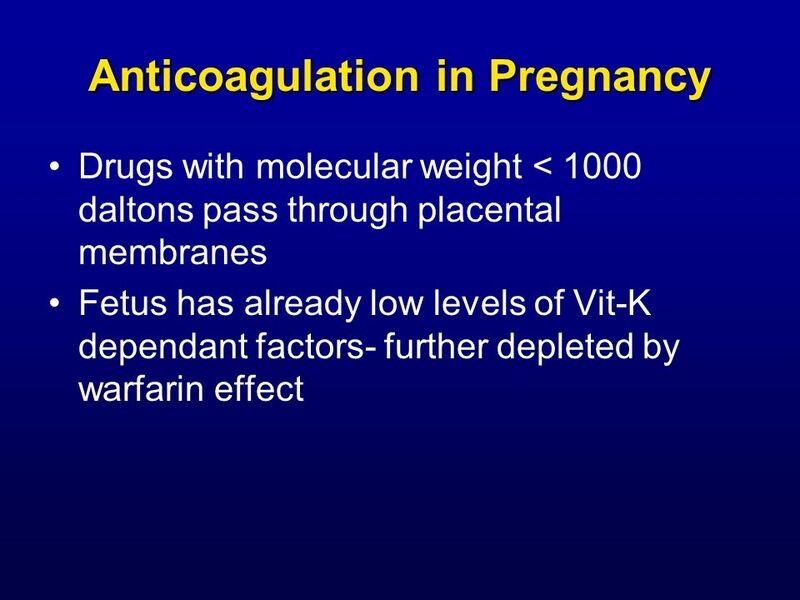 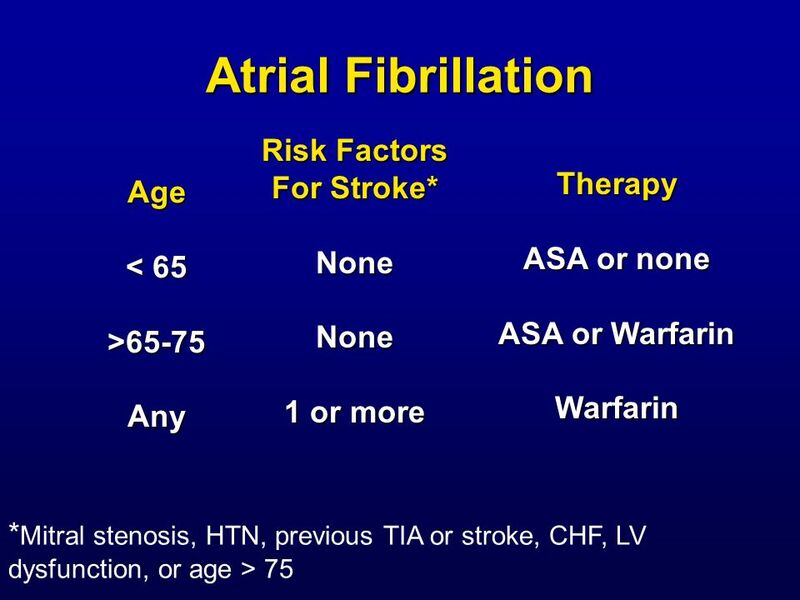 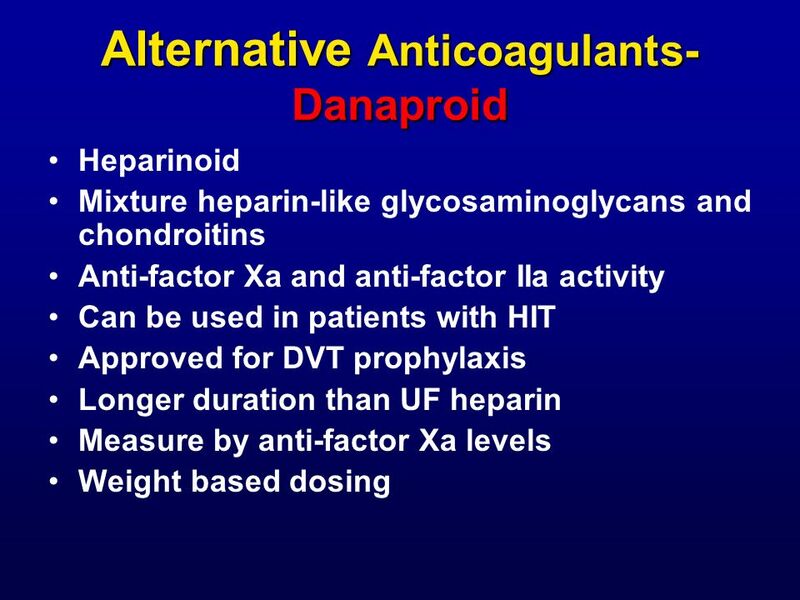 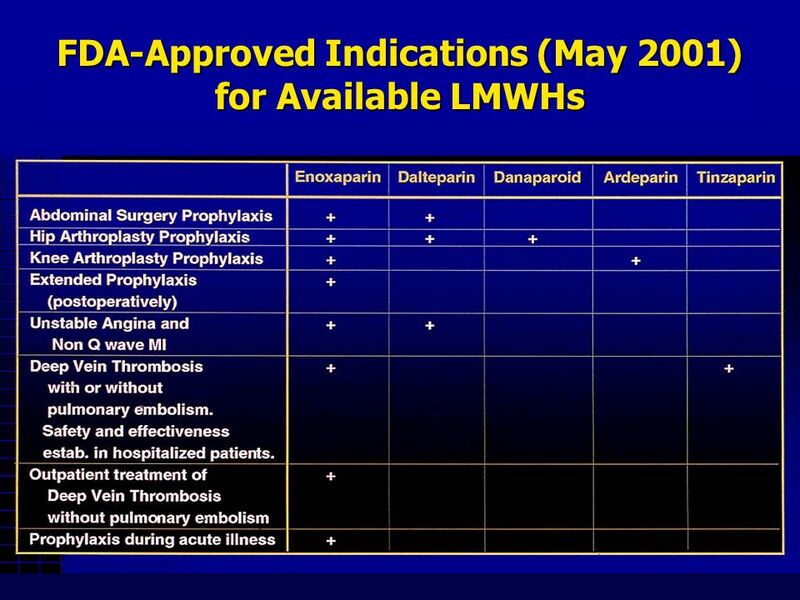 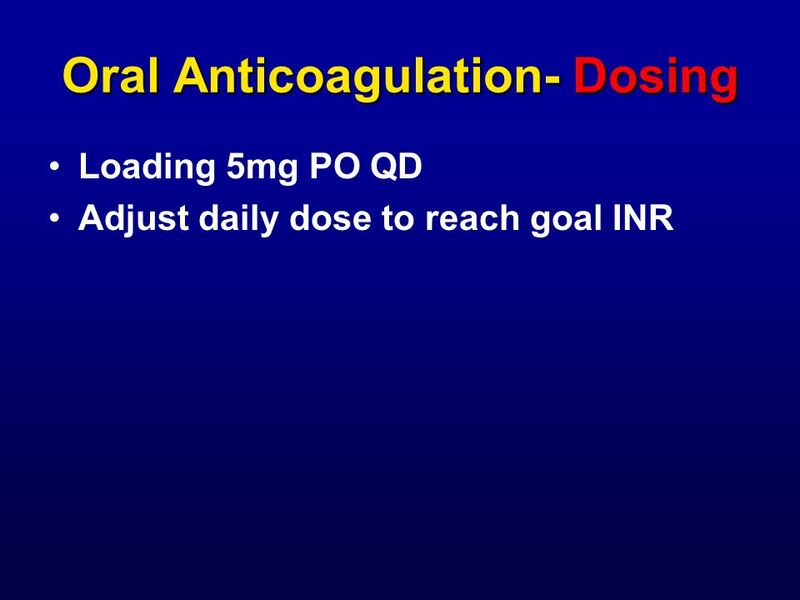 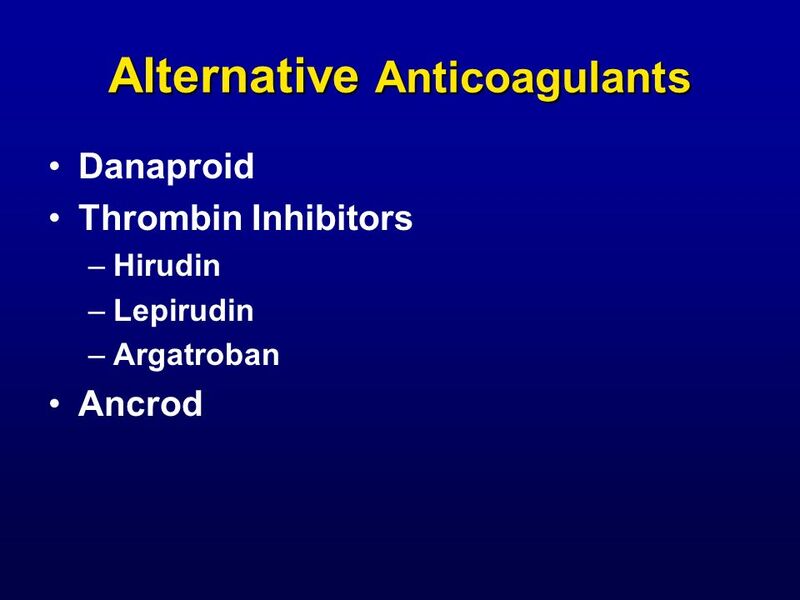 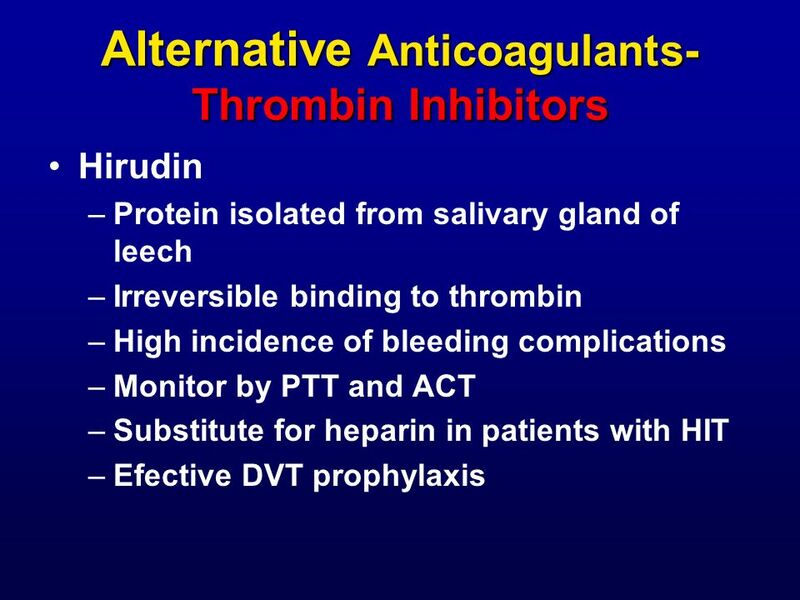 ANTICOAGULANT THERAPY REVISITED 2004 or, Which one(s) of these drugs should be the one(s) I use, and for what? 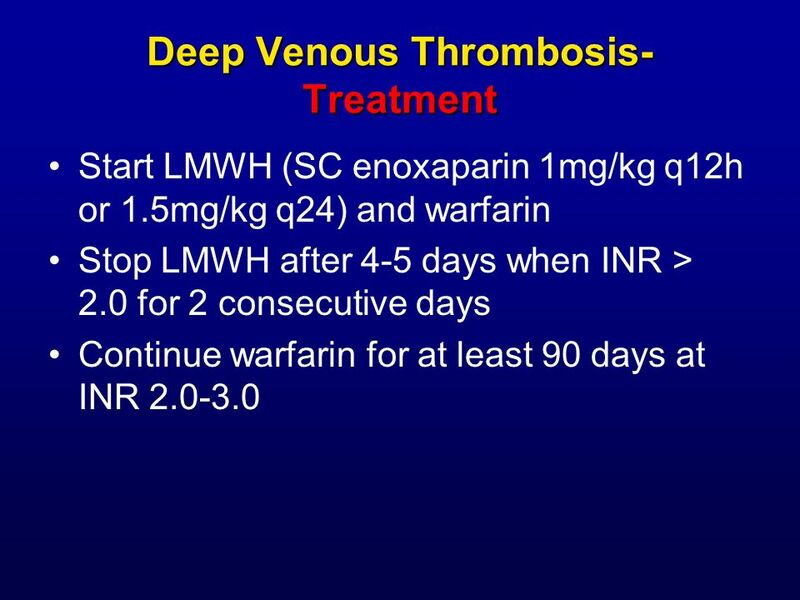 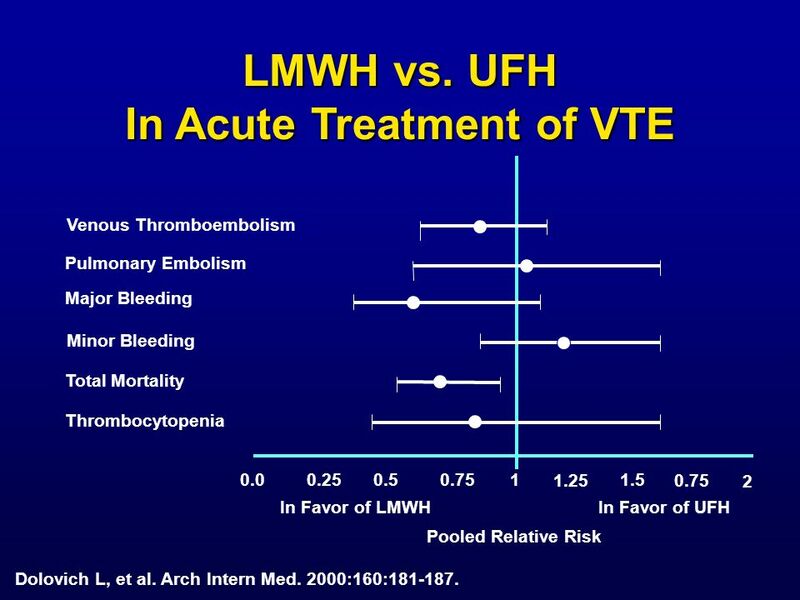 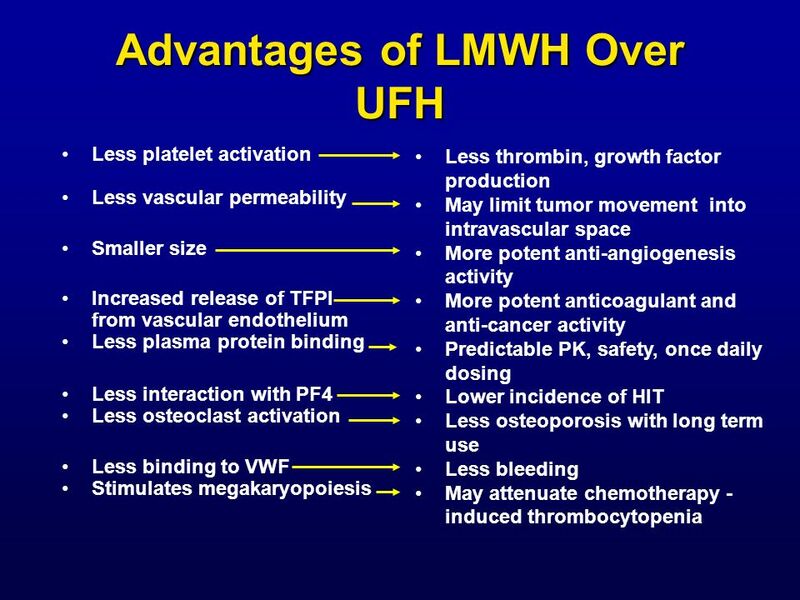 LHD Logo Venous Thromboembolism Reducing the Risk DATE. 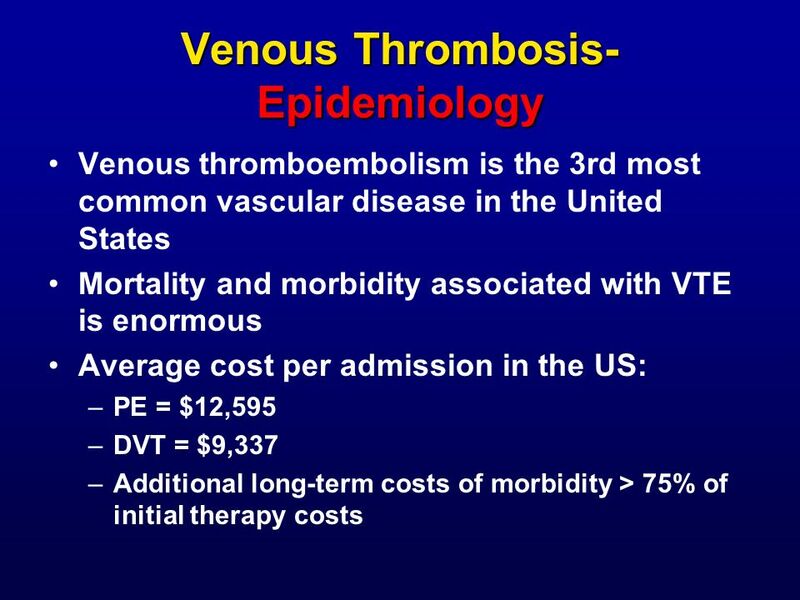 Chapter Six Venous Disease Coalition Acute Management of VTE VTE Toolkit. 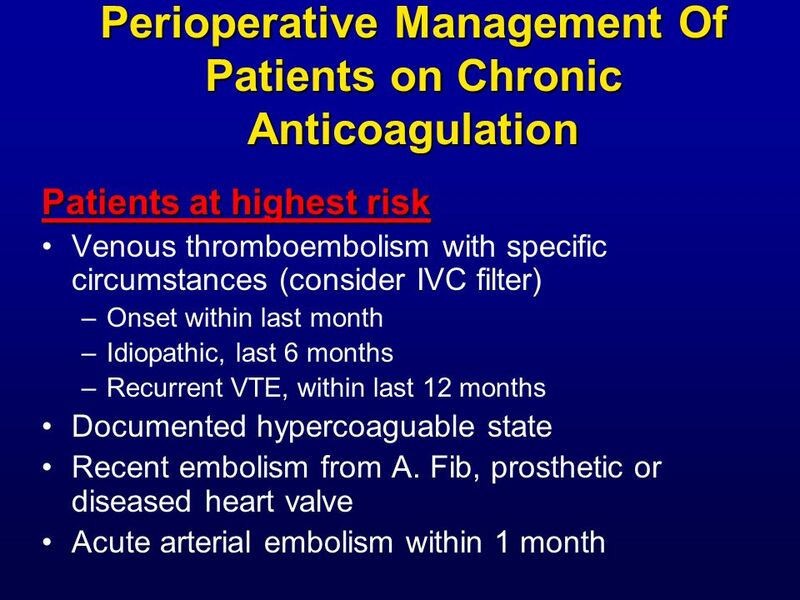 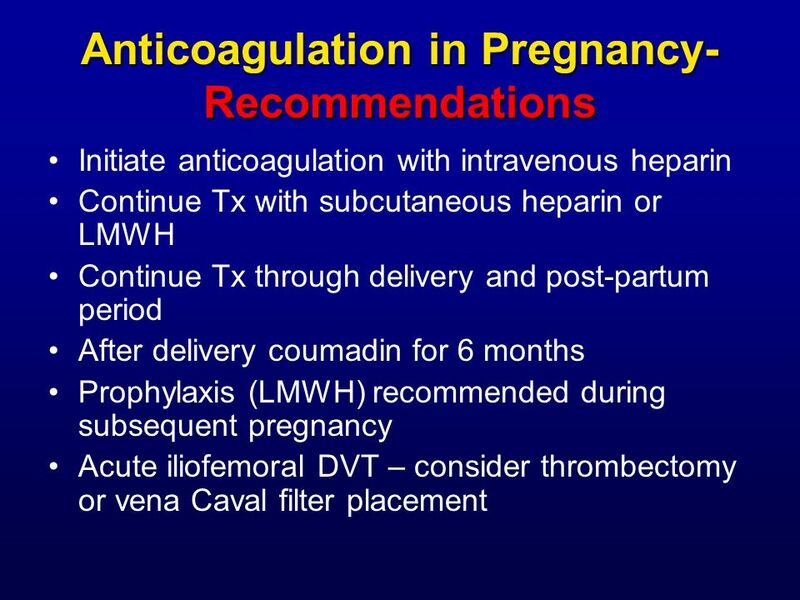 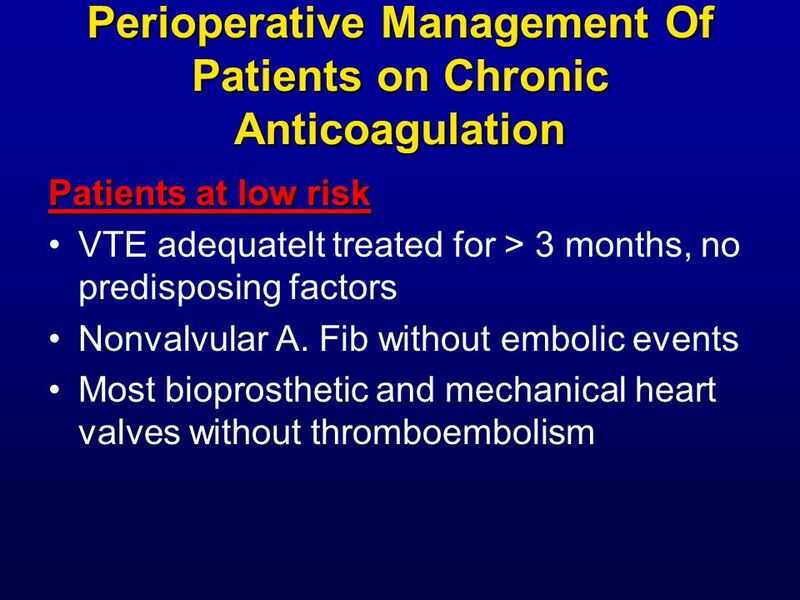 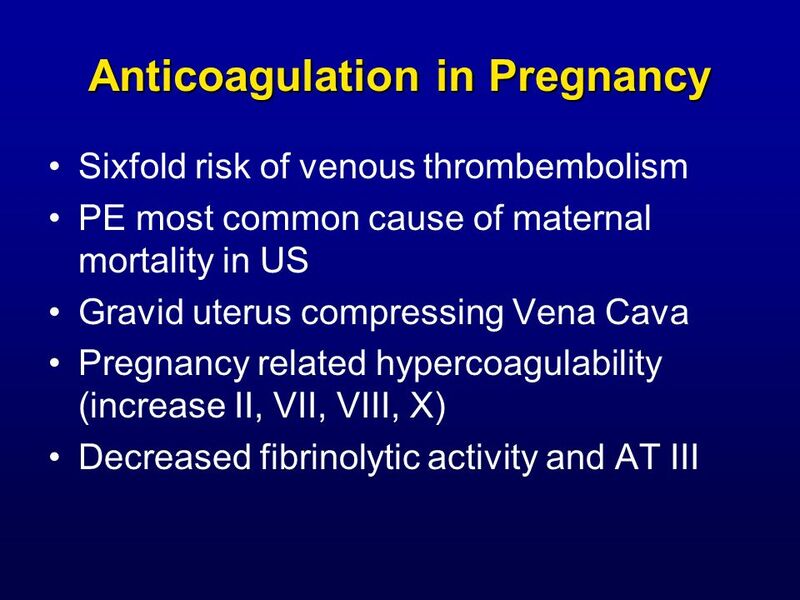 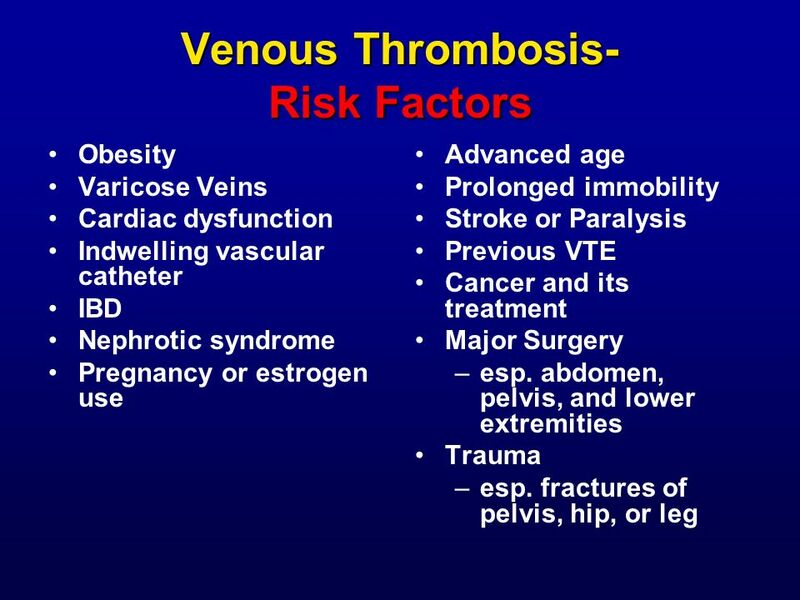 Venous Thromboembolism Prevention August Venous Thromboembloism Prevention 2 Expected Practice  Assess all patients upon admission to the ICU for. 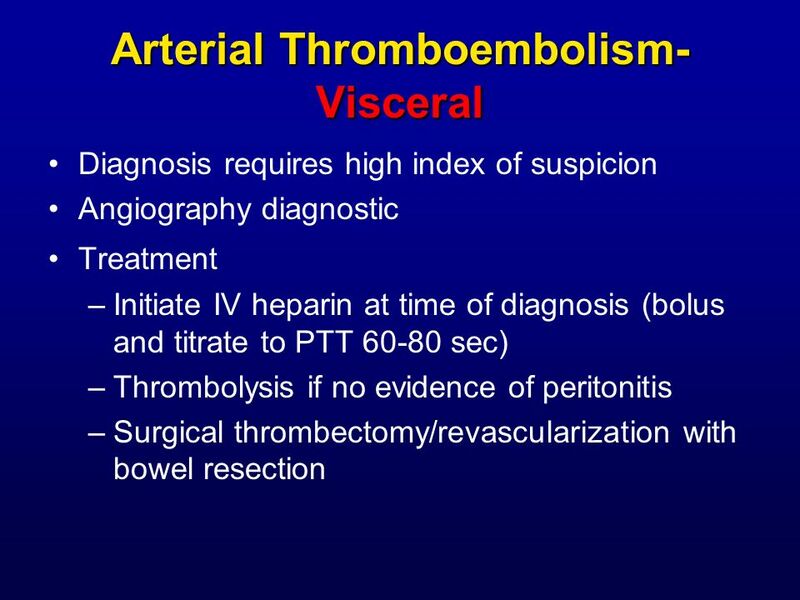 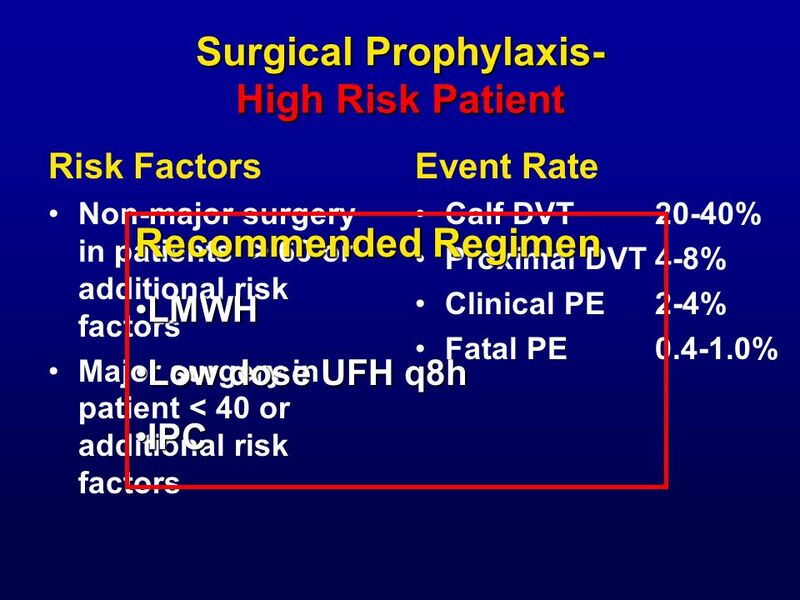 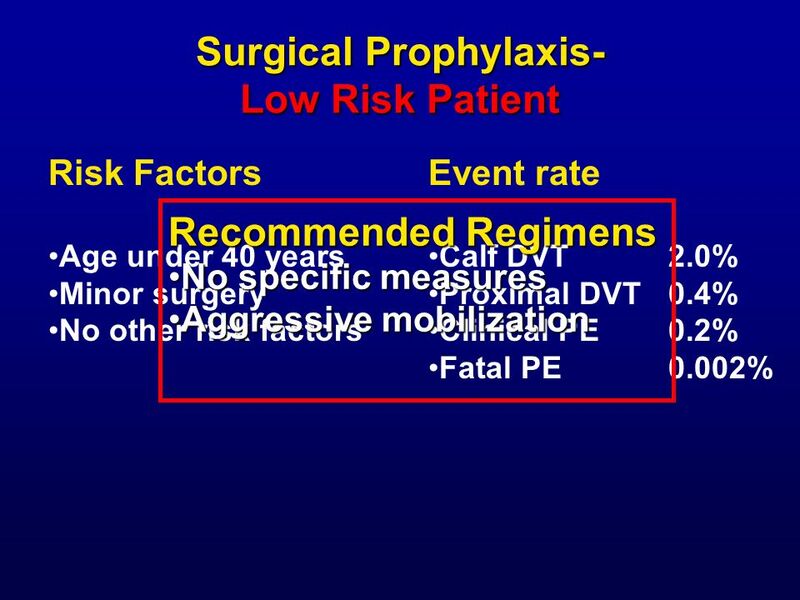 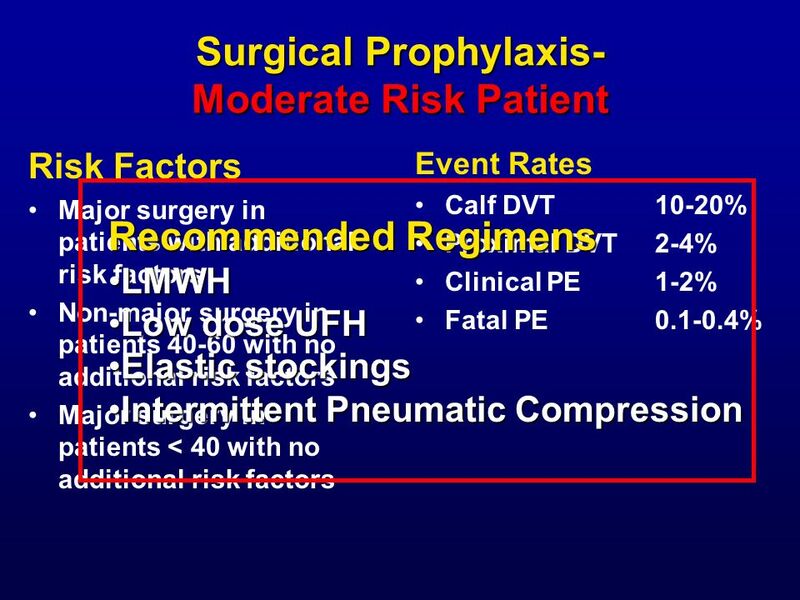 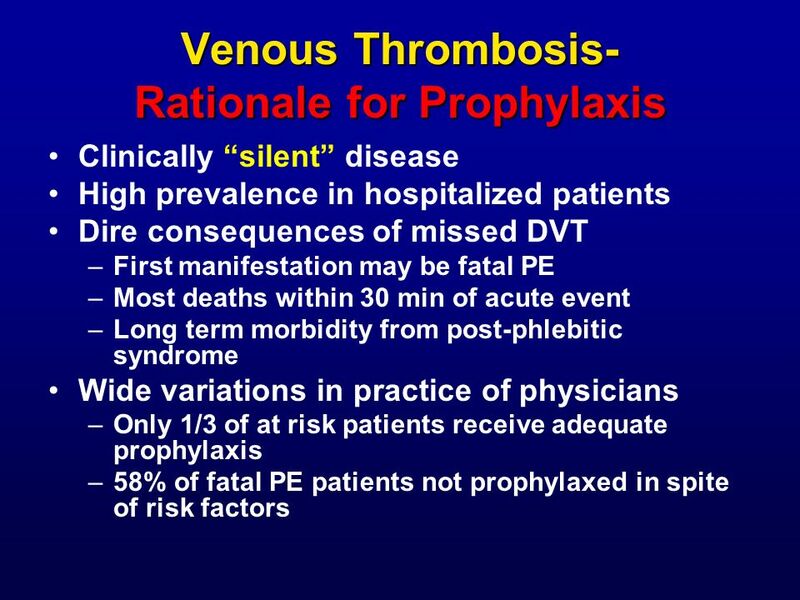 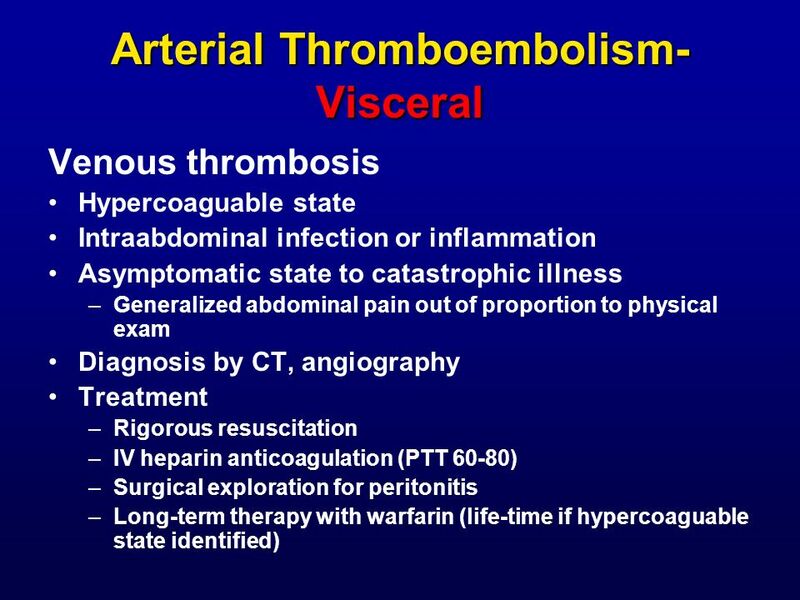 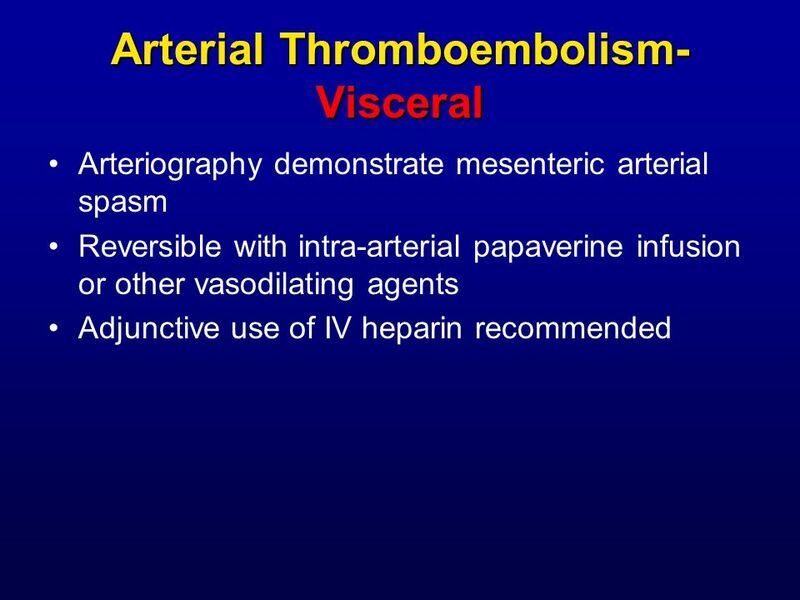 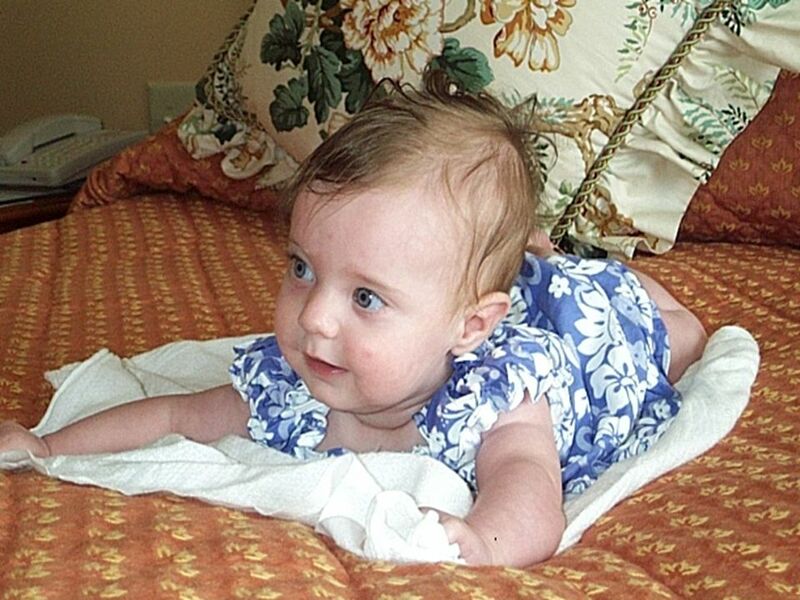 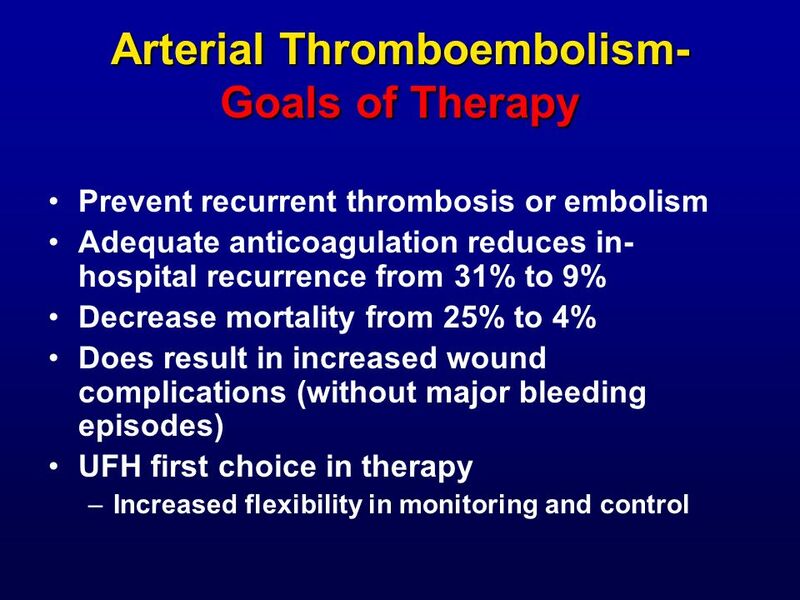 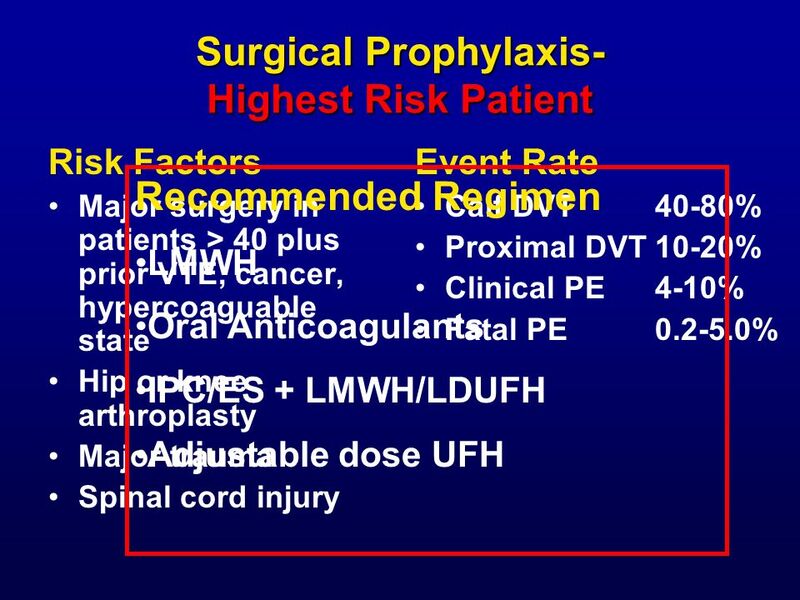 Venous Thromboembolism in the Surgical Patient: Prophylaxis and Treatment Pamela Hebbard August 11, 2005. 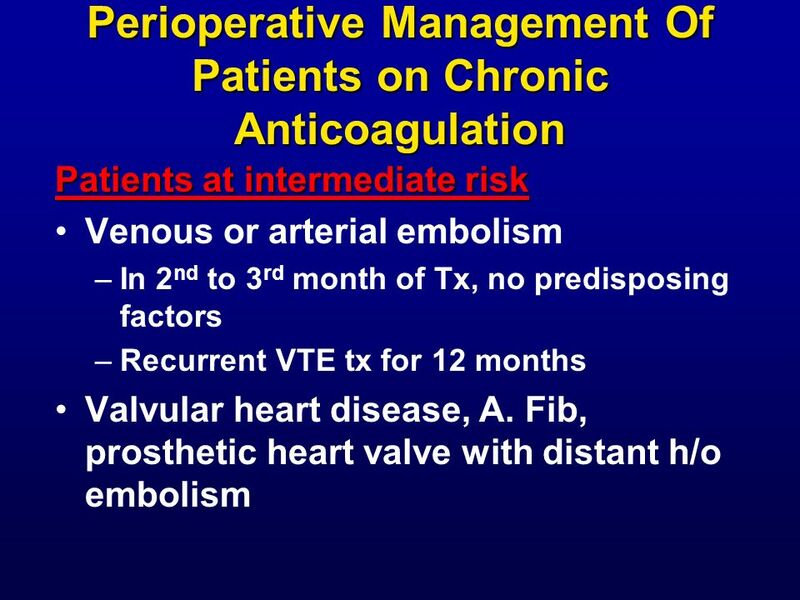 Perioperative Medicine Beyond Cardiac Clearance Pamela Pride MD July 31, 2012 MUSC.